A big Government push is under way to stop six more national nurses’ strikes by getting their union back to talks today. Sources said there were frantic efforts behind the scenes over the last 24 hours to find new grounds to ask the Workplace Relations Commission or Labour Court to step in. They said the Government is willing to table a review of nurses’ roles that would also examine staffing levels, and might report next year. But it is unclear how the crucial issue of pay will be dealt with. The State mediation bodies are unlikely to get involved unless there is some sign that the deadlock over the nurses’ demand for a pay rise can be broken. An attempt by senior ministers to get the nurses back to talks earlier this week drove an even deeper wedge between the sides. It was shot down by the Irish Nurses and Midwives Organisation because of a Government precondition that pay would not be discussed. But Government officials were last night going through the clauses of the current public sector pay deal “with a fine tooth comb” to explore avenues to resolve the row. Healthcare services have been plunged into chaos and nurses are planning another 24-hour stoppage tomorrow. This will be followed by three in a row from Tuesday to Thursday next week and another two strikes the week after that. “The aim is to get the nurses back to the negotiating table tomorrow,” said a Government source last night. They said the effect of the strike in terms of patient care has hit home within Government circles. “There is a lot of work under way to see if we can get to a position to invite them back into talks within the existing framework of the current pay deal,” the source added. The Workplace Relations Commission is willing to facilitate talks but the Government would prefer the dispute to end up at the Labour Court. It is seen as having the potential to resolve the row more swiftly by issuing a recommendation that might be accepted by both parties. Senior INMO official Tony Fitzpatrick said “we need to get back to the Labour Court”. However, he added that the Government must come in “unconditionally”. 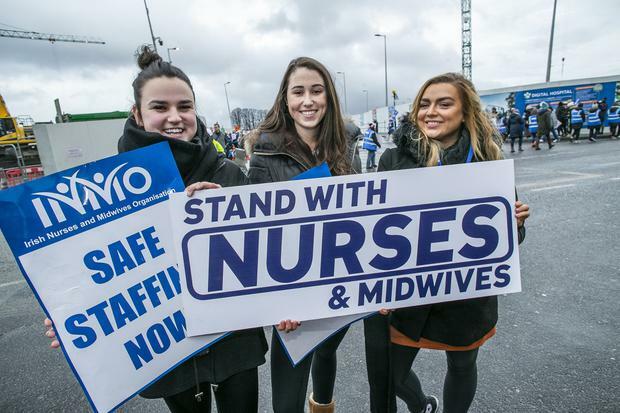 Deputy general secretary of the union Dave Hughes warned there will “have to be money involved” to resolve the dispute as “nurses will not get off the streets empty handed”. He claimed the threat of knock-on claims is a “fallacy”. He denied there would be a domino effect if nurses were rewarded for extra duties they have taken on. He said these include drug prescribing and triage, for which there is no “grade attached”. Meanwhile, the Department of Public Expenditure and Reform said nurses’ basic pay would rise from between 22pc to 40pc over the next two years if an extra 12pc pay rise was granted. A newly qualified staff nurse will see their basic pay rise by 25pc from €29,056 to €36,196 by the end of next year. However, a 12pc increase would push it to €40,540 in October next year – an increase of €11,484 or 40pc in just two years. Fianna Fáil leader Micheál Martin called for a mediator like the former head of the Workplace Relations Commission, Kieran Mulvey, to intervene. “Substance must replace spin in the resolution of this dispute,” he said.